If your thinking about buying or selling you home, you need to consider using a professional to help you navigate the journey. We can help you put all the pieces together. With first hand knowledge of the market, in our area, we run stat reports for the trends from one neighborhood area to another-yes they can be different. Are homes selling for 97% or 101% of asking price? How do you know what the best offer is when selling your home…is it really just the sales price? What does it take to win when a buyer is in multiple offers? What is the inventory like…the absorption rate? We help you understand the different dynamics of accepting an offer or presenting an offer and our consulting skills help you understand your options so you can make intelligent choices. Whether buying or selling a home there needs to be good access to the home. Buyers usually need a Realtor® or agent to access a home-unless it is an open house. The good news for a buyer is it costs the buyers nothing to hire a Realtor®. Seller’s generally find having an agent is a much safer alternative than just allowing anyone into their home. The use of a secure lockbox that only a buyers agent has access to is generally the best way for allowing buyers access to tour the home. If you are considering FSBO, consider your safety…who is actually coming into your home and why are they really there? As a REALTOR® who has worked with many service providers over the years, we can recommend excellent trustworthy lenders, inspectors, title companies and even lawyers, if the need arises. We have a special list of local service providers who we trust and can recommendation, from interior designers, stagers, plumbers, electricians, handymen and other service trades throughout the real estate transaction and when you hire us we are happy to share these resources. When we represent you, you’ll have an experienced advocate and negotiator. Buying a home is an emotional process. For most people, it’s the biggest transaction of their life and it’s often done during other major life changes, such as a job relocation, “right” sizing for a growing family or empty nesters, or in the unfortunate event of a job loss, a bankruptcy or even a divorce. Strong emotions and stress can muddle ones judgment – this can cause you to make a decision you might later regret. As your agent, we look at a transaction from a business perspective with an experienced, clearer and unemotional perspective. We can help you better understand your options, and serve as a balance against making decisions that might be reckless. Sometimes even family member who are trying to protect you may even give you advice that is incorrect. When at the negotiating table, we are your advocate…we treat your money like it is our money. Money is an emotional issue and we’ll get you the best deal possible, without letting strong feelings get in the way. 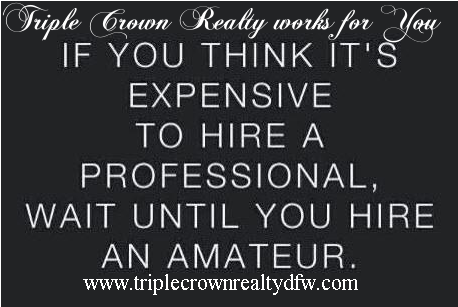 At Triple Crown Realty, this is particularly true – we want you to be 100 percent satisfied with the home you purchase. On the buy-side, an agent services are free. Some believe that they’ll save money by not using an agent to buy a home. This isn’t true. The entire commission on a home purchase is paid by the seller to the seller’s broker, who in turn gives part of the commission (usually half) to the buyer’s broker. It’s tempting to think that if you don’t use an agent, you will save money, but this is generally not the case. Before the listing even goes on the market, the commission rate is agreed upon via a listing agreement contract with the listing agent and the seller. If you as a buyer, decide you don’t need representation from a buyer’s agent, the entire commission is then paid to the listing agents broker. The listing agents broker would have to agree to change the listing agreement contract to cut you in on part of that compensation, and this is highly unlikely. Drafting or receiving a contract can be complex and knowing the contract inside and out is very important. As you can imagine, every –i- must be dotted and every –t- must be crossed, because there are 100 pieces of paper requiring upwards to 43 signatures and initials, and making a mistake can be very costly to you. Every item in the contract is important. Failing to know the importance of certain line items could cost you a lot of money down the road. Knowing what to look for or how to write an offer with the the best possible terms allows us to ensure your interests are protected and that your offer is accepted. Why it is important to use a full time experienced REALTOR®? Every transaction has 100 to 150 phone calls alone, and each one of them is loaded with critical details. How does it make you feel knowing that there are 43 different people from 14 different industries who get involved during the seven stages of your transaction? It’s important that you find an agent that is dedicated, knowledgeable about the different aspects of the transaction and has no conflict of interests. It is important they are committed to you! We believe good communication, transparency and working hard for our clients is very important… for you choosing the right agent is just as important as making sure a home is the right fit for you!